5. I take magnesium, Saw Palmetto each day for prevention and over the counter PM pain killers to help me sleep through an acute attack. I’ve tried relpax, avamigraine, tonopan, depakote, imitrex, nortriptilene and the list goes on with no success. I’m getting ready to meet with a new neurologist. The last did all he could but the prescription meds did nothing to help me – story of my life. 8. My strangest migraine symptoms are: Frequent Urination which I experience prior to an attack and sometimes during one. 11. The most frustrating part about having a migraine attack is: My life has to be put on hold. 12. During a migraine attack, I worry most about: If it’s a whammy the pains too much for me to worry. If it’s not, I worry about being a burden and I worry about everything that needs to be done but I can’t do. Sometimes I worry about dying. 13. When I think about migraine between attacks, I think: Is this it? Have I finally struck upon something that works? or Take your time, don’t over do it, you don’t want to trigger a migraine. N.B. I’m very rarely migraine free. 14. When I tell someone I have migraine, the response is usually: Oh I’m so sorry/I have them too. 15. When someone tells me they have migraine, I think: Honestly – I wonder if they really know what a migraine is. Then I think aww… not another sufferer. 16. When I see commercials about migraine treatments, I think: LIARS! 17. My best coping tools are: My religious beliefs and the support of my family. 18. I find comfort in: reading and mediating on the Bible; praying; attending congregation meetings; low key nights with my hubby; family gatherings – when I can attend; blogging and assisting in volunteer work when I can. 19. I get angry when people say: I have headaches too. You just need to get out more. You need to exercise more. 20. I like it when people say: Tell me what your life with migraine is like. Not for pity, I just want to be understood. 21. Something kind someone can do for me during a migraine attack is: Phone to find out if I need something to eat. 22. 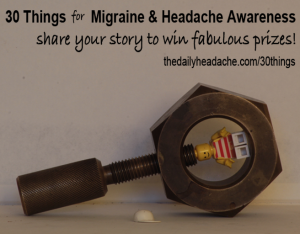 The best thing(s) a doctor has ever said to me about migraine is: You have chronic migraine. We need to break the cycle. I never knew that the majority of my headaches (which never stop – literally), were migrainous. My husband and I were on the search for what was wrong with me. That neurologist finally answered our question. 23. The hardest thing to accept about having migraine is: You must work within your limitations. 24. Migraine has taught me: To be empathetic towards others. 26. If I could go back to the early days of my diagnosis, I would tell myself: Find a headache specialist. 27. The people who support me most are: My husband, parents and sister-in-law. 28. The thing I most wish people understood about migraine is: It’s not just a headache. It’s disabling neurological disease. 29. Migraine and Headache Awareness Month is important to me because: Because we need to be understood and we need better treatment plans across the board. Not just one or two patients who happen to strike upon the right doctor. 30. One more thing I’d like to say about life with migraine is: This neurological disease takes so much away from you. It takes your life, your freedom, your self-esteem, your passion and so much more.